Mark Zuckerberg runs Facebook. 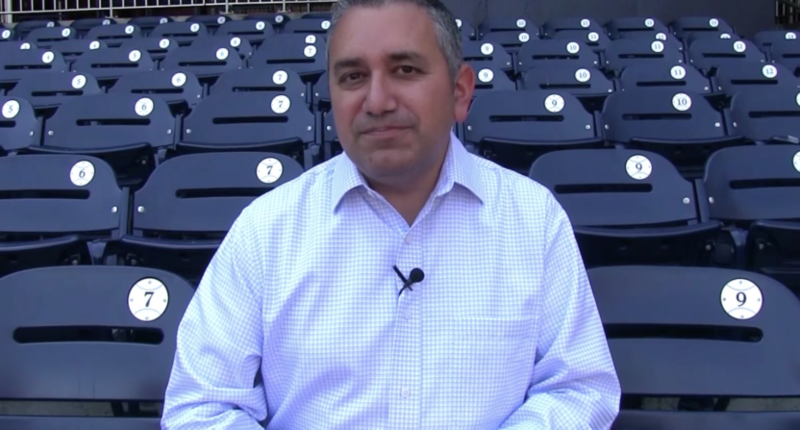 Mark Zuckerman covers the Nationals. A disturbing number of Twitter users can't tell the difference. Mark Zuckerberg does not have an official Twitter account, which makes some sense given that he’s the founder and CEO of Facebook. That means that when you log on to Twitter, fuming at the latest news about Zuckerberg’s company, click the “tweet” button and type “@MarkZuck,” it’s not the Facebook honcho who pops up but rather the blue-checkmarked account of Mark Zuckerman, a Washington Nationals beat writer for the regional sports network MASN. More often than you might imagine, especially with Facebook all over the news in recent months, Twitter users seeking to scold Zuckerberg wind up yelling at Zuckerman instead. Such confusion has led to an amusing running joke in which Zuckerman quote-tweets people angry with Zuckerberg, as if they’re actually frustrated with something regarding the Nationals. And so on. Scroll back through Zuckerman’s tweets and you’ll find hundreds of similar jokes, some better than others, all entertaining. Zuckerman says he first received a tweet intended for Zuckerberg about five years ago. In the beginning, he simply retweeted the mistaken messages and moved along. But his followers seemed amused by the errors, so he began quote-tweeting the complaints with jokes, often ones related to the Nationals, and before long the quips were a distinct part of his Twitter identity. Last season, MASN produced a video that was part public-service announcement, part mean-tweets segment, in which Zuckerman made light of the frequent mix-ups. PSA: Our beat writer Mark Zuckerman is NOT Mark Zuckerberg! WATCH him read tweets directed toward the Facebook founder in our hilarious edition of "mean tweets. "Hit LIKE or SHARE or spread the news that ZuckerMAN is not ZuckerBERG! #IBackTheNats ??? Zuckerman does not call out everyone who mistakes him for Zuckerberg, only those who lead him into a good joke. When the people he quote-tweets recognize their errors (which happens about half the time, he estimates), he assures them his crack was all in good fun and everyone gets a laugh. But over time, the shtick has begun to get a bit less funny for Zuckerman. He says the tone of the tweets in his mentions has changed in recent years, with the 2016 presidential election representing a notable turning point. Back before Facebook became the bane of conservative and liberal internet-users alike, Zuckerman-Zuckerberg confusion on Twitter arrived only occasionally. But the election, Zuckerman says, caused a spike to about two or three a day, and the recent scrutiny of Facebook’s privacy practices has led to an unprecedented surge. Zuckerman says there was a day recently when he received 100 tweets meant for Zuckerberg. Amid the recent barrage, Zuckerman decided to take a little break, and for a week or two, he ignored all anti-Facebook tweeters. But when fans began to complain in his mentions Wednesday about Facebook’s glitchy stream of the Mets-Phillies game, he couldn’t help himself. As the anger toward Facebook ratchets up, Zuckerman isn’t sure how much longer he wants to wade through replies meant for Zuckerberg. The Facebook CEO will testify before Congress next week, and if the public response is too brutal, Zuckerman may call it quits. Zuckerman knows, meanwhile, that if Zuckerberg runs for president in 2020, his mentions will really light on fire. He will not, however, choose a new Twitter handle or display name. The beat writer might want to add one more piece of advice for the Facebook CEO: Get your own Twitter account.